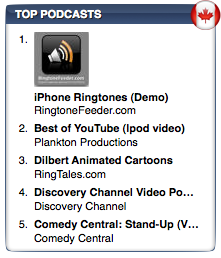 We just noticed that RingtoneFeeder is currently the #1 Podcast in Canada. Needless to say – we are of course really excited about that and would like to thank all the canadian subscribers for your support! We are working on a number of new initiatives at the moment and we think it is going to be a really exciting autumn so stay tuned.